Location: Off the coast of Newport, Oregon. End of research cruise. Throughout my life there have been moments when I recognize I am in the presence of something truly unique and special. Moments when I realize just how beautiful our planet can be. Moments I know will be engraved in my brain as life passes by. Hiking Zion National Park, night boat riding down the beautiful Saint Lawrence Seaway in the heart of the Thousands Islands, the view on top of Whiteface Ski Mountain, climbing the mountain islands in Greece, landing a helicopter on an Alaskan glacier, gigantic waves crashing in on an empty Puerto Rican beach with nothing but the moon in sight, taking a train ride up the gigantic Alps, and color of the fall leaves over the Castleton University skyline in Vermont are just a few of those moments I have been so privileged to have experienced in my short life. Monday evening, I got to add another new nature wonderland experience aboard the NOAA Bell M Shimada. It was 5:15pm and I was eating a terrific dinner when one of the scientists came in the galley to tell us fishing was on hold because of the abundance of marine wildlife that was surrounding our ship. I immediately ran upstairs to check it out. When I stepped in the bridge (command room of the ship) the first thing I noticed was the beautiful blue skies with a touch of clouds and the sun that set the stage for the spectacle. My ears rang with the crashing waves against the boat and seagulls squawking in the background. As I looked over the side of the boat there were two pairs of dolphins synchronized swimming all around the ship. After a few minutes, three California sea lions came floating by on their backs waving at the passing ship. Another minute later, the dolphins came back for their encore followed by a spray of a Humpback whale spouting directly behind it. As the whale came closer it swam gracefully in an up and down pattern until it bent its massive dinosaur-like body down followed by its tail flipping over as it took a deep dive below the surface. As soon as the whale took the dive another pair of sea lions came floating by smiling as they took in the heat of the sun. Before I could look again, a Pelagic Cormorant landed directly in front of me on the ship. Right after I took a picture of that I looked up and saw at least fifteen spouts surrounding the ship like a spectator would see at the Bellagio Hotel light show in Las Vegas. For the next hour whale after whale surfaced, spouted, and even breached behind the beautiful blue sky backdrop. No matter where I looked I was seeing whales grace our presence. No camera could capture the magic of that hour as I ran from side to side on the viewing tower above the bridge to soak in as much of this experience as possible. I was in awe at the majesty of the sea creatures. As the ship made its way through the evening and to sunset, the whales slowly trickled off beyond sight as the sun came down in the background. Hope that future generations can experience this beauty for centuries to come. The reality is the ever growing world’s population consumes large amounts of fish. The Food and Agriculture Organization of the United Nations states that in 2016, the global seafood trade was worth $140 billion. In the US it is estimated that 1.5 million people are employed by the fishing industry. That is a lot of communities and families that rely on the resources in our water systems. Throughout the week I learned that so much of the work of NOAA is not limiting the growth and catch of our fishermen/fisherwomen, but it is to ensure there is a fish population to catch and future generations can experience what I was able to experience these past two weeks. Part of NOAA’s mission is to conserve and manage coastal and marine ecosystems and resources. Having the most high tech equipment constantly being researched to seek improvements mixed with “ground truthing (catching and surveying)” to analyze different species is crucial for the future of the world’s fisheries. Two weeks ago I wrote about the main goals for this research cruise. The first was to gather data to study the impact of the US 32mm net liners and the CANADIAN 7mm net liners. The second was to compare the old acoustic equipment called the EK60 with the new equipment called the EK80. Throughout the last two legs of the trip, scientists have gathered data and will be working on analyzing it over the coming months to make better conclusions on these goals. The vision is for someday to reduce the number of surveying trawls needed to determine the population of fish, and instead, use this highly advanced acoustics equipment instead. If those ships are filled with as curious, hardworking, and focused people as the people I met on this ship, I am confident we will be able to obtain this goal in the future. Hake are present. . . it’s go time! Throughout the past two weeks I constantly thought about how I can bring my experience back to my students in Baltimore. My students receive half the amount of hours of science instructional time than math and reading. After much reflection I decided to use the same core standards we are obligated to teach but begin rewriting most of the 6th grade statistics unit. At the start of the unit I will begin with the purpose of NOAA, pictures of my trip, and exciting stories from my adventure. From there I will have investment in the subject from my students which will allow me to dive in to applying data collected at sea to find: mean, mode, range, variability, mean absolute deviation (MAD), and interquartile range (IQR). We will also be able to use real live data to create histograms, frequency tables, box and whisker plots, and dot plots. I believe it will be exciting for them to have the opportunity to apply required statistical concepts to learning how NOAA (along with others) survey our fish population so species will survive for generations to come. It will also make our school’s 6th grade teacher, Mr. Davis, very happy! An example of my change in classroom instructional materials to teach Box Plots with data from the research cruise. At any given moment, there are thousands of NOAA employees studying our environment across the globe. I had the honor of sailing with incredibly intelligent and hardworking people who are dedicated to the mission. From them, I learned so many valuable things that I will carry with me as I disembark on Friday. Chief Scientist, Rebecca Thomas was an excellent manager/role model. She taught me that leading through kindness, support, trusting others, and giving people rest will produce better and more accurate results than pushing people past their limitation. Scientist Steve de Bluis encouraged me to maintain a hobby outside of work that you love. Steve loves to fly planes and dive and talked about these trips all the time. You can tell how much joy it has brought him and how excited he is to continue to dive well into his retirement in a few years. He was also a BEAST in the wet lab! Roommate and Future Scientist Charlie Donahue taught me the importance of accuracy over speed. He constantly pushed me to be sure the data we were collecting was as accurate as possible. He never let speed and efficiency take away from quality. For those of you who know me, this is certainly an important push for me! Scientist John Pohl taught me about supporting newcomers. He was the first guy I met aboard and always spent time breaking down complicated science topics for me. Scientist Melanie Johnson taught me about working through chaos with calmness. She has been on both commercial and scientific ships and constantly kept calm during any situation that arose. Scientist Dezhang Chu (Super Chu) taught me about focus. No matter what was going on “Super Chu” always kept a clear view of his own goals and purpose aboard and stayed focused on the prize. Chu was also super hard working and was in the acoustics lab at 6:30am when I went to the gym and still in on his computer analyzing data from the day when I returned from yoga at 10pm. I think he could even give KIPP Ujima Resident-Principal Reese a run for it in terms of work ethic! Volunteer Scientist Heather Rippman taught me about service and life-long learning. Heather commits herself to volunteering for important science missions across the country. After leaving an executive position with Nike, she now travels and volunteers to learn all she can about marine science and give back to the marine science community. She shared so much knowledge with me and was the first person to teach me how to dissect hake. Master Chef Arnold Dones reminded me about the power of food bringing people together. At exactly 7am, 11am, and 5pm, roughly 40 people from all over the country with all types of jobs aboard came together to feast. Arnold made that happen because of the pride he takes in his craft. Chief Engineer Sabrina Taraboletti spent 3 hours with me on our last day to show me the massive engine room. She explained what every piece of equipment does below deck. I learned the science behind creating freshwater from sea water. I learned the regulations behind sewer and contaminants. The best part was climbing to the bottom of the ship and watching the shaft that makes the propeller turn move. Her team of engineers barely see daylight and work long hours to make sure the ship moves safely and all the amenities and scientific research equipment works flawlessly. She keeps the morale of her team high, keeps an impressively organized work space that is approximately the size of over a dozen typical garages, and is one of the most knowledgeable professionals I ever crossed paths with. Ms. Ellmauer is a 25 year veteran science teacher from my hometown of Liberty, NY. She was also my high school ski coach. She has been following my blog and reached out about information on how to apply. I am humbled to see so many teachers and school officials reading my blog from across the country so I thought I would pass on the website with information about the program and how to apply for this once in a lifetime experience. Please reach out to me at JAGarritt@gmail.com if you have any questions. 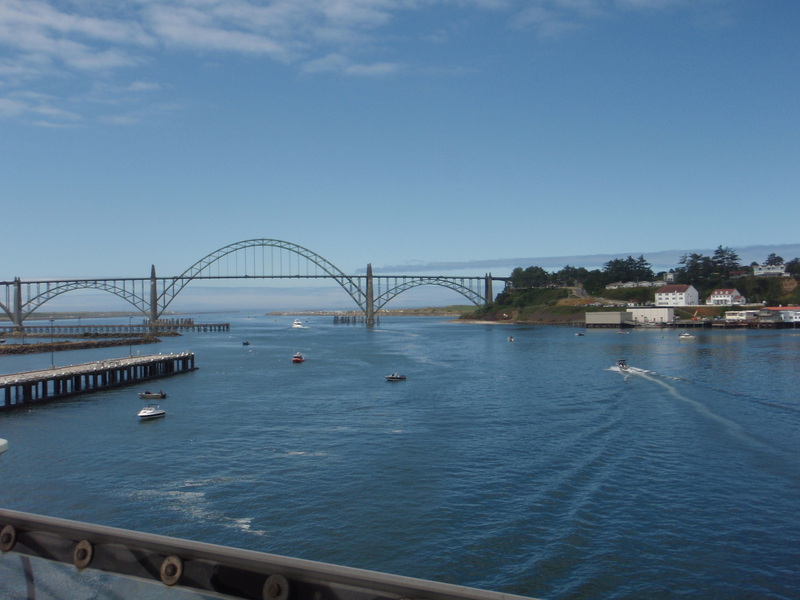 Tomorrow we pull in to Newport, Oregon, and the research cruise will come to an end. Thank you to the nearly one-thousand readers who have been following my journey. I am grateful for your support. Today’s blog will focus on calibration and a tour of the beautiful ship. Calibration is the act of evaluating and adjusting the precision and accuracy of measurement equipment. It is intended to eliminate or reduce bias in an instrument’s readings. It compares the standard measurement with the measurement being made by the equipment. The accuracy of all measurements degrade over time by normal wear and tear. The purpose of calibration is to check the accuracy of the instrument and with this information, adjustments can be made if it is out of calibration. The bottom line is that calibration improves the accuracy of the measurement device which improves quality. We calibrate many things in life. For an example, many teachers at my school have smart bo ards or promethean boards. These boards are interactive white boards that allow teachers to teach using more interactive tools. As a math teacher, I have had a promethean board in my classroom which acts like a large touch screen computer that I take notes on, teach lectures on, give student feedback on, and play math games on. They have improved the learning experience for students in my class and across the globe. In order for the screen to work most accurately, we must perform routine calibrations on the board. If we don’t, there is often errors and where we touch the screen is not what actually shows up on the board. When these errors begin to occur, we must calibrate the board or else we won’t be as accurate when writing on the board. Police officers and military personnel must also use calibration in their work. Officers must routinely calibrate their weapons for accuracy. When at a safe and secure range, officers will “site-in” their weapons to determine if their scope is accurate. They will then make modifications to their weapons based on the calibration tests. This is another form of calibrating that improves the quality and accuracy of the equipment. On board the NOAA Ship Bell M. Shimada, calibration typically happens at the start and end of most legs. Sometimes the Chief Scientist will also make the decision to calibrate mid-leg. For the past two days we have been spending 12 to 15 hours per day calibrating the equipment to ensure the most accurate research can be completed and we can meet the goals of the leg. 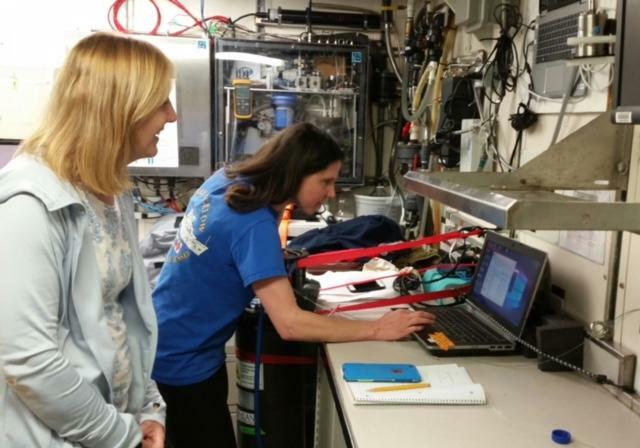 Calibrating the equipment is an interesting process that involves the teamwork of all the scientists on board. The process begins with three scientists setting up down riggers on the outside of the boat. Two are set up on starboard side (right side of the ship) and one is set up on port side (left side of the ship). This creates a triangle which will allow the calibration sphere or what I like to call, “the magic sphere” to move in whatever direction needed. This same triangle shaped design is used to move cameras that fly above players in the Superbowl. This same triangle shaped design is used to move cameras that fly above players in the Superbowl. The picture above shows how three lines suspended from down riggers that are attached to the sphere. The pictures (with captions) show the process step by step. This screen monitors where the sphere is under the ship. The goal during calibration is to move the sphere is all four quadrants of the screen. We calibrated for two full days. It was surprising how long the process took. After explanations from the many scientists on board I learned that the process is so long because we are assessing numerous acoustic transducers under the ship. Then, for each transducer, we are calibrating the old acoustic system and the new acoustic system. NOAA Ship Bell M. Shimada is an incredible vessel that sails for months at a time. It has a crew of over 40 people (who I will be discussing in future blogs). The ship is a science lab with most state of the art equipment and also home for the crew on board that make the boat run 24 hours a day for 365 days a year. Here is a quick behind the scenes look at this remarkable vessel. The Deck: When you embark the ship, the first thing you see is a huge deck with massive pieces of equipment. Each item has a different purpose based on what scientific study is taking place throughout the leg of the journey. Two of the nets we will be using to catch hake and other organisms. Each net has different size liners which we will be testing. The Bridge: This is where the captain and his crew spend most of their day. The bridge has all of the most up-to-date technology to ensure we are all safe while on board. Operations occur 24 hours a day, so the ship never sleeps. Officers on the bridge must know what is happening on the ship, what the weather and traffic is like around the ship. The bridge has highly advanced radar to spot obstacles and other vessels. It also is the center of communication for all units on board the ship. The officers of NOAA Ship Bell M. Shimada. 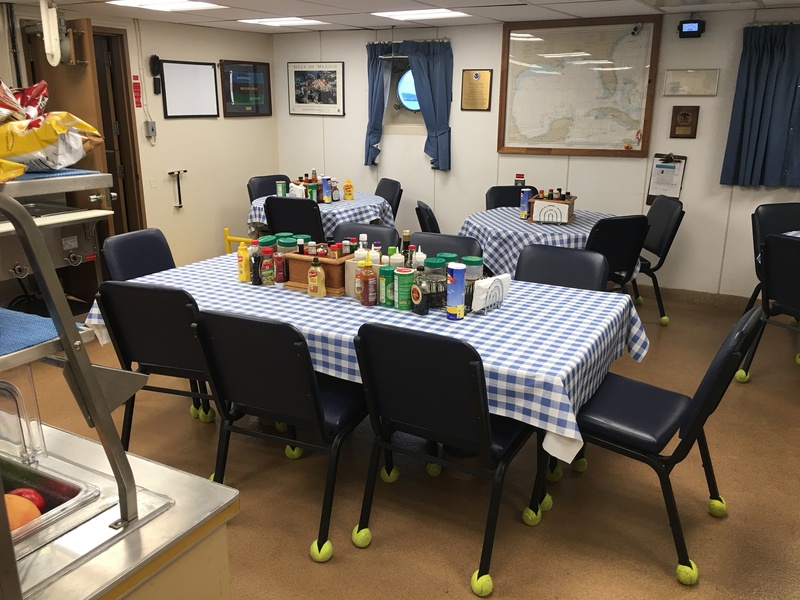 The Galley and Mess Hall: I expected to come on board and lose weight. Then I met Arnold. He is our incredible galley master who makes some of the best meals I have had on a ship. Yes, this better than food on a buffet line on a cruise. Arnold works his magic in a small kitchen and has to plan, order, and organize food two weeks out. Breakfast, lunch, and dinner are all served at the same time everyday. The food is prepared and everyone eats in the mess hall. Beverages, cereal, salad, and most importantly, ice cream are available 24 hours a day, so there is no need to ever be hungry. Every meal has a large menu posted on the television monitor and you can eat whatever you want. Every meal so far has been amazing. An amazing buffet is served three times a day at 7am, 11am, and 5pm. Staterooms: Sleeping quarters are called staterooms and most commonly sleep two people. Each stateroom has its own television and a bathroom, which is called a head. As The bunks have these neat curtains that keep out the light just in case you and your roommate are working different shifts. The Entertainment Room: The living room of the ship. This room has a large screen TV, comfy recliners, and hundreds of movies, including new releases. The Acoustics Lab: The acoustics lab is like the situation room for the scientists. There are large computer screens every where that can monitor all of the things the scientists are doing. For the past two days, Rebecca, our Chief Scientist, along with other scientists, lead the calibration from that room. The Wet Lab: The wet lab will be used to inspect and survey the hake when we start fishing later this week. I only just began my exploration of the ship. I will have so many more places to share throughout the journey. Later this week I will be asking our Chief Engineer to take me on a behind the scenes tour of “below deck” which is where they turn salt water to freshwater, handle all trash on board, etc. I will also be asking a member of captain’s officers to teach me a little about the navigation equipment up in the bridge. I will be sure to write about all I learn in future blogs. Thank you for continuing to join me on this epic adventure. Today was day two and my first full day on-board. I learned so much about the National Oceanic and Atmospheric Administration (NOAA). I learned about what our ship, Bell M. Shimada’s, mission was this cruise. I started to get acquainted with all the impressive things the ship has to offer. However, what I enjoyed most was meeting all the wonderful people who spend their lives on-board for months (or even years) serving us. Every single professional was warm and welcome and answered the thousand questions I asked today with a smile. It was an amazing day because of the crew and scientists who already made me feel at home. I was unaware of what NOAA did before joining the Teacher at Sea Program. 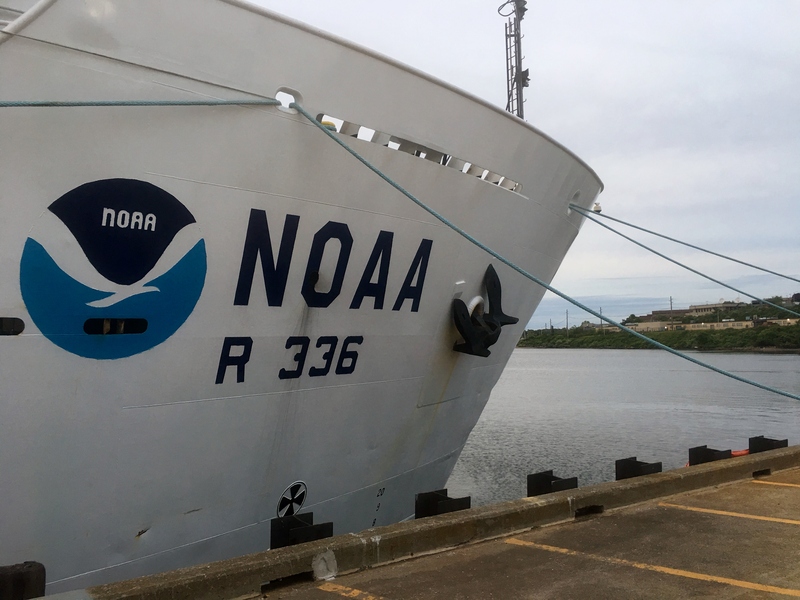 Today’s post is all about NOAA, the ship I am sailing on, and the mission ahead the next two weeks. What is NOAA? Before I can get in to details about my journey, here is some information about the governmental agency that welcomes Teacher At Sea applicants with open arms. The National Oceanic and Atmospheric Administration (NOAA) is an American scientific agency that focuses on the conditions of the oceans, major waterways, and the atmosphere. It was formed in 1970 and as of last year had over 11,000 employees. NOAA exists to monitor earth systems through research and analysis. It uses the research to assess and predict future changes of these earth systems and manage our precious resources for the betterment of society, the economy, and environment. One component of NOAA studies our oceans. They ensure ocean and coastal areas are safe, healthy, and productive. One of the many ships that are used to study the oceanic environment (which I am fortunate to sail on these next two weeks) is NOAA Ship Bell M. Shimada. 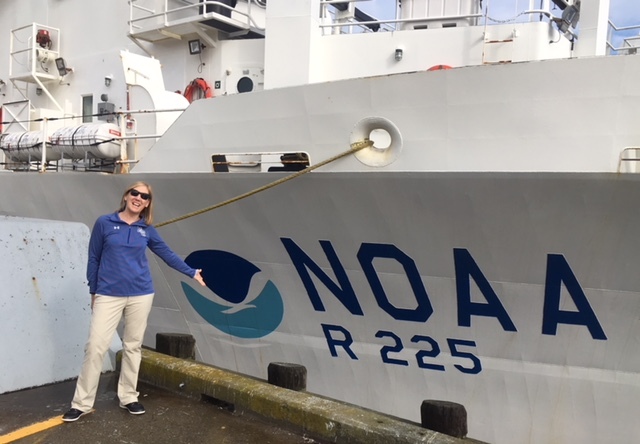 This ship is stationed on the west coast with forty-plus crew who work endlessly to make this ship run so NOAA scientists can perform important environmental studies. Every person I have met the past two days has been remarkable and you will hear more about them throughout my future blogs. Why Are We Sailing? NOAA Ship Bell M. Shimada is one of dozens of NOAA ships that sail the ocean every day in order to research vital information about our environment. Every sailing has clear objectives that help achieve the goals that the National Oceanic Atmospheric Association sets. 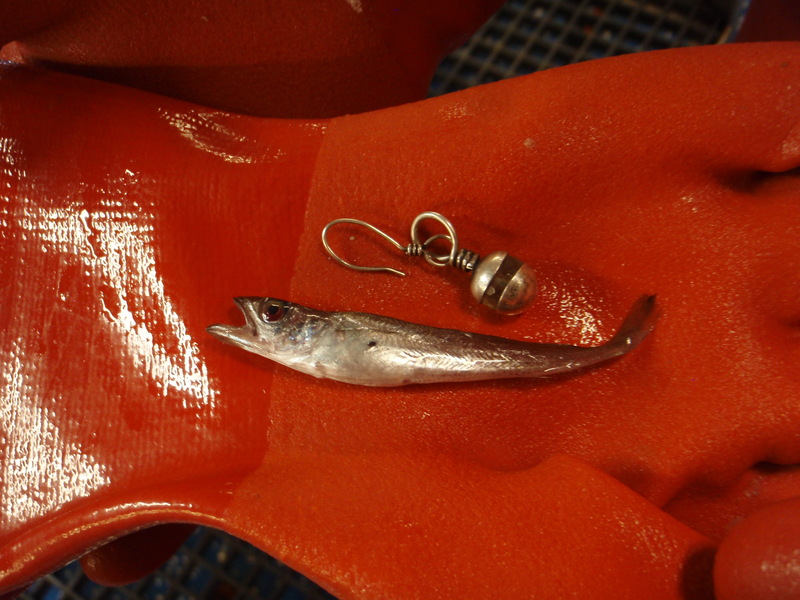 On NOAA Ship Bell M. Shimada, hake fish surveys are completed every other year and research is done during off years. Fish surveys determine estimates of certain fish species. This vessel sails the entire west coast of the United States and then works with their Canadian counterparts to provide an estimate of a variety of species. NOAA uses this information to provide the fisherman with rules governing the amount of species that can be fished. During research years, like the one I currently am on, the vessels have different objectives that support their work. 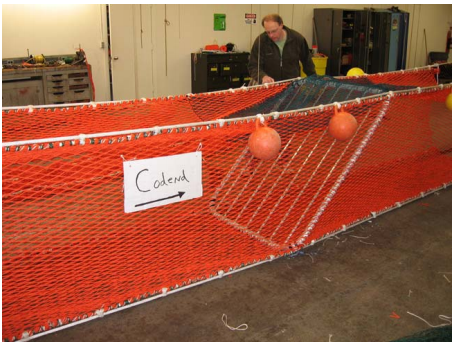 #1: Pair trawling to determine net size impact: Evaluate the differences between the US 32mm nets and the CANADIAN 7mm nets. The questions being asked are does the differences in size of the two nets affect the size, characteristics, or species of fish being caught during surveys. The reason this research is needed is because currently the Canadians and the United States have always used different size liners on the far tip of the net while surveying. The purpose of this experiment is to eliminate the possibility that there is bias in the data between the two countries when surveying their respective territories with slightly different net sizes.The hope is that the different liners do not affect the size, characteristics, or species of fish being caught during surveys. 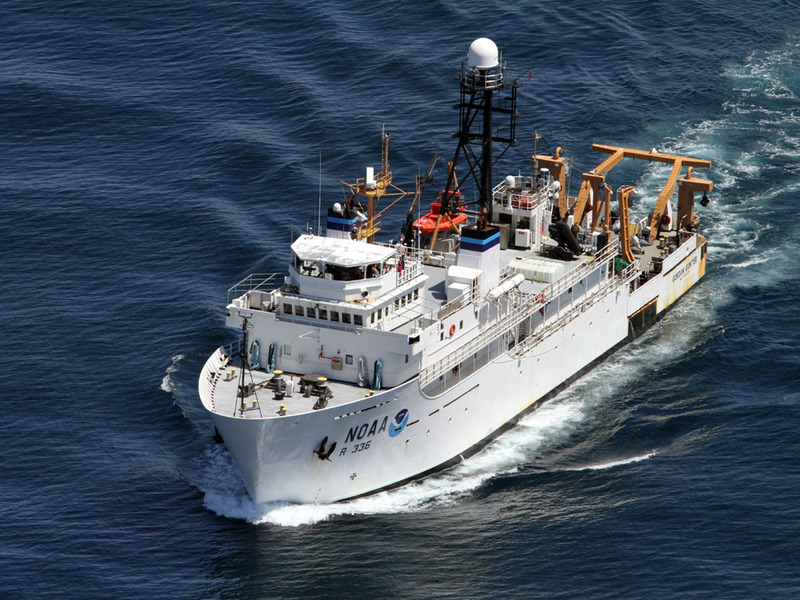 OAA Ship Bell M. Shimada these echoes provide information on fish size, location, and abundance. NOAA is modernizing all of their acoustic equipment to a higher range of frequency. This is equivalent to when televisions went from black and white to color. This will hopefully allow scientists to collect more precise and accurate data. The second goal of this cruise is to determine the differences in the frequency levels of both the new and the old technology. The goal in the long run is to reduce the number of surveying trolls needed to determine the population of fish, and instead, use this highly advanced acoustics equipment instead. It would be a more efficient and environmentally smarter option for the future. #3: Using oceanography to predict fish presence: During the night time, scientific studies continue. The ship never sleeps. Depending on where we saw and caught fish during the day time experiments, the captain will bring the boat back to that same area to determine what water characteristics were present. 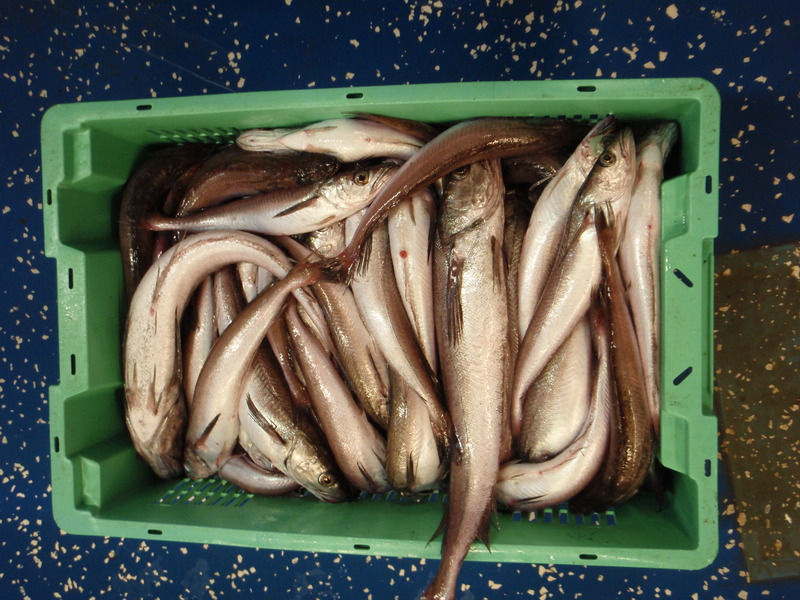 The goal is to find the correlation between increased hake presence and certain water characteristics. Throughout the next two weeks I will take you behind the scenes on how the ship is collecting data and using the data to create a hypothesis for each goal. 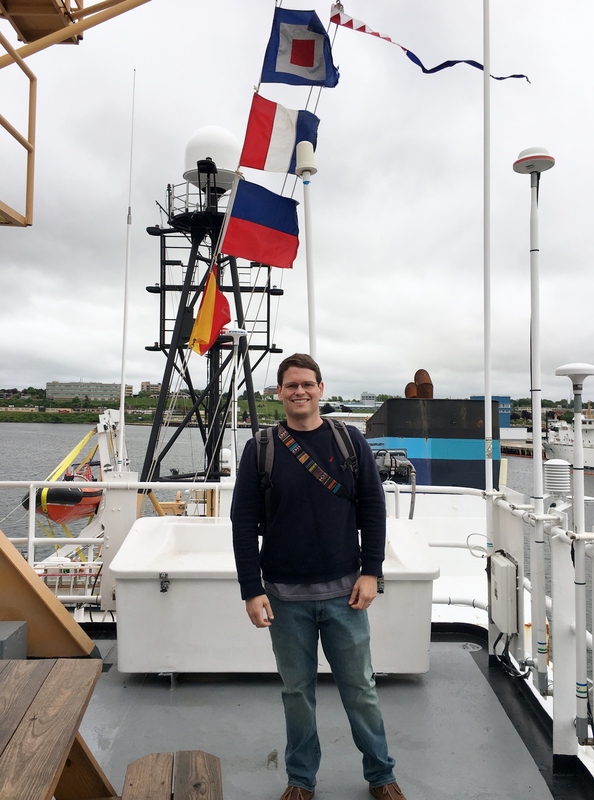 Geographic Area of Cruise: Northeastern Coast U.S.
Tuesday, May 22, I arrived at Newport Naval Base and boarded NOAA Ship Henry B. Bigelow to begin my Teacher at Sea journey by staying overnight on a docked ship. Day 1 was filled with many new experiences as we headed out to sea. The Henry B. Bigelow is part of a fleet of vessels commissioned to conduct fishery surveys. To learn more about the Henry B. Bigelow, check out this website: Henry B. Bigelow. The objective of this cruise is to access the hydrographic, planktonic and pelagic components of North East U.S. continental shelf ecosystem. The majority of the surveys we will take involve the microbiotic parts of the sea – phytoplankton, zooplankton and mesoplankton. Plankton are small microscope organisms in the oceans that are extremely important to the entire Earth ecosystem. These organisms are the foundation of the entire ocean food web. By studying their populations. scientists can get an accurate picture of the state of larger ocean organism populations. Before leaving the dock, I met with Emily Peacock from Woods Hole Oceanographic Institute (WHOI) to learn how to run an Imaging Flow Cytobot instrument that uses video and flow cytometric technology to capture images of phytoplankton. The IFCB was developed by Dr Heidi Sosik and Rob Olsen (WHOI) to get a better understanding of coastal plankton communities. The IFCB runs 24 hours a day collecting sea water and continuously measuring phytoplankton abundance. 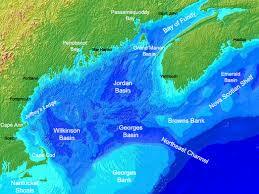 Five milliliters of sea water are analyzed every 20 minutes and produces the images shown below. The science party on board is made up of scientists from National Marine Fisheries Service (NMFS) part of NOAA Fisheries Division. 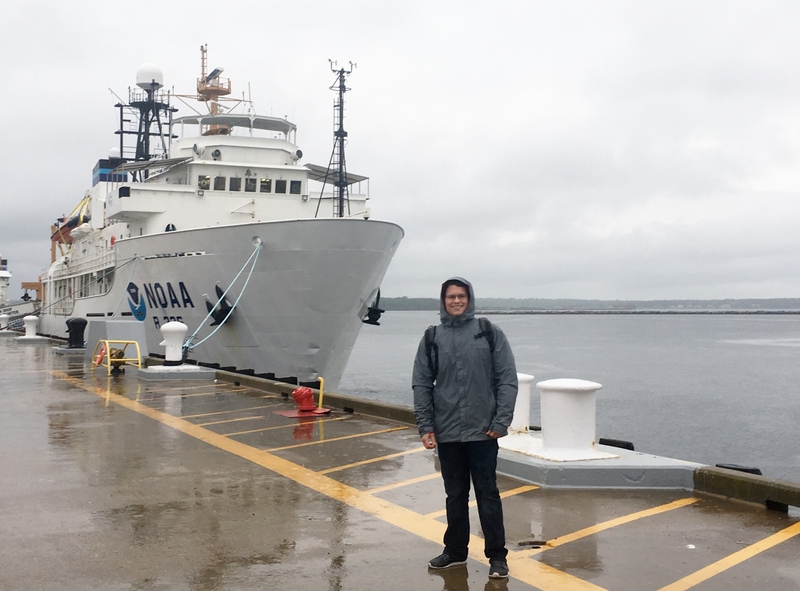 The chief scientist, Jerry Prezioso, works out of Narragansett Lab and the lead scientist, Tamara Holzworth Davis, is from the Woods Hole Lab, both from the NOAA Northeast Fisheries Science Center. Other members of the Science Party are Seabird/Marine Mammal observers and a student from Maine Maritime Academy. The Crew and scientist group work together to coordinate sampling stations. The crew gets the ship to the site and aid the scientists in deploying instruments. The scientists collect the data and samples at each station. The Crew and scientists work together to find the best and most efficient sea route to each sampling site. Note all the stops for specimen collection on map below. There definitely has to be a plan! It has only been two days but I feel very acclimated to life at sea. I am not seasick, thanks to calm seas and the patch. Finding the way around the ship is getting easier- it is like a maze. Spotting a pod of humpback whales breaching and basking sharks was a highlight of the day. My Biology students back at May River High School scored great on End of Course Exam. Congratulations May River High School Sharks! Thinking of y’all. The 224-foot Gordon Gunter at Pier 2 at the Naval Station Newport on the morning of sailing Leg 2 of the Survey. 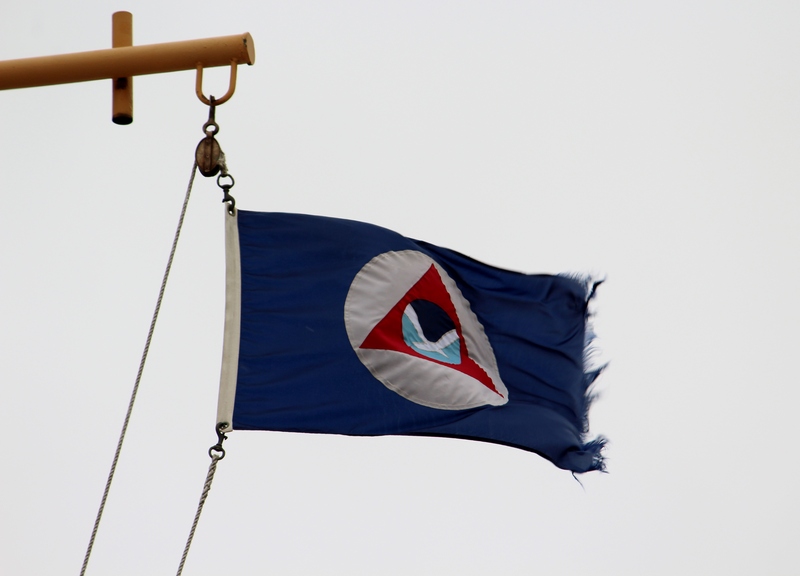 Greetings from NOAA Ship Gordon Gunter! On my flight into Providence, Rhode Island (the Ocean State) I was met with lengthy coastlines and beautiful blue skies. Jerry Prezioso, (one of NOAA’s oceanographers), picked me up from the airport. We made our way to the ship, Gordon Gunter, at Pier 2 at the Naval Station Newport. To get there, we drove 37 miles southeast of Providence and crossed the Jamestown Verrazzano Bridge and the Newport Bridge. Both bridges offered stunning scenes of shorelines that separated the picturesque sailboats from the majestic beach side houses. Newport, also known as City by the Sea, was a major 18th-century port city which is evident from the high number of surviving buildings from the colonial era. Upon arrival at the pier, I passed two immense U.S. Coast Guard ships before laying eyes on what would be by new home for the next ten days—NOAA Ship Gordon Gunter. Several members of the crew were already there to welcome me aboard. The crew’s hospitality and Jerry’s tour of the ship eased my anxiety while at the same time, intensifying my excitement for the adventure that awaits. After the tour, Jerry showed me to my stateroom. I was surprised to find out that I have my own cabin! There is a refrigerator, closet, desk, recliner, my very own sink, and a shared bathroom with the room next door. It also has a TV to watch any of the movies available on the ship. After unpacking my luggage, I decided I would spend some time exploring the ship. I took photographs and captured 360-degree images of the ship’s many spaces. I intend to use my footage as a way to give my students a virtual tour of Gordon Gunter. When Jerry showed us the ship, he effortlessly moved from one place to the next. I, on the other hand, could not…at first. I felt as if I was stuck in a labyrinth. Yet, with the amount of time I will be spending on board Gordon Gunter, I am sure it will not take long to get the “lay of the land”. Getting lost is not always a bad thing. I can admit that I was not too upset when I took a wrong turn and ended up in the galley (the kitchen). 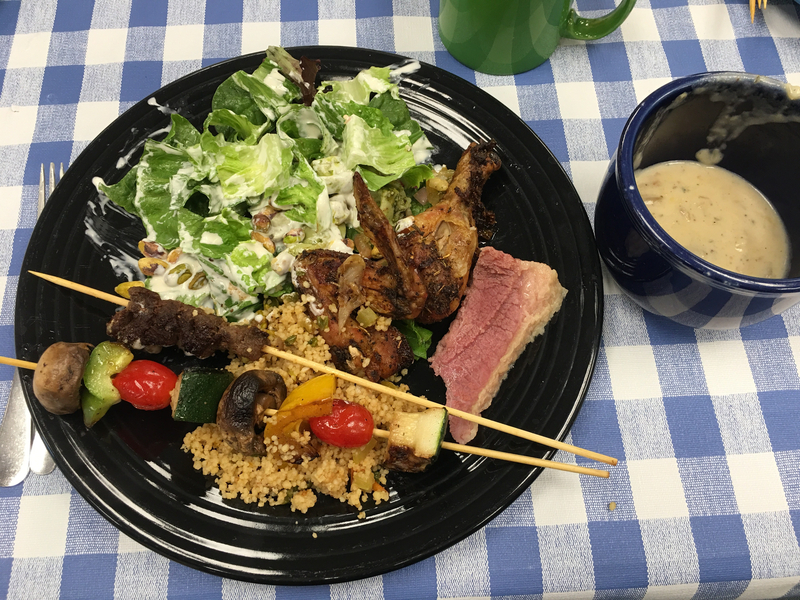 I could tell right away from the appetizing aroma and the fresh fruits and vegetables that the meals were going to be amazing. After Leg 1 of the Spring Ecosystem Monitoring (EcoMon) Survey which concluded on Friday, May 26. Prior to the ship’s departure at 1400 hours on Memorial Day, the crew was busy with important maintenance and upkeep. With the adventure of a lifetime so close at hand, I could only hope that my excitement would give me at least a few hours of sleep. My first dinner on board ship Gordon Gunter. To keep everyone happy when they are living in such close quarters, working strange shifts, and so far from home, good food is vital. Isn’t it always? Gordon Gunter is well known in the NOAA community for its fantastic food. The person responsible for our delicious and abundant food is Margaret Coyle, Chief Steward and her trusted comrade, Paul Acob, Second Cook. I first experienced their culinary skills at my first 6:30 a.m. breakfast. Remarkable! I could not wait for the meals to come. Margaret has worked on NOAA Ship Gordon Gunter for 13 years! Before NOAA, Margaret was in the Coast Guard for four years and her husband retired from the Coast Guard with 21 years of service. Margaret makes almost every dish from scratch—from juices to hummus. She is dedicated to providing a variety of meals that not only fill bellies but satisfy taste buds. You never quite know what to expect one meal to the next, and that my friends is the spice of life! Paul has spent 14 years with NOAA and 20 years in the Navy—that’s 34 years at sea! I greatly admire both Paul and Margaret for their service and continued commitment. As a Teacher at Sea, I am an active member of the science team. I have been assigned the day shift, which means I work from 12 noon to 12 midnight. I am happy with this shift because it is a little more of a regular schedule compared to beginning work at midnight and then sleeping during the daylight hours. However, it will definitely take time for me to adjust my eating and sleeping schedules with that of my work shift. In preparation for our work at sea, we spent the afternoon reviewing guidelines and proper procedures. Safety is crucial on any ship, and I feel much better having gone through the welcome orientation. Now, I am prepared when it is time to perform any of the three emergency drills: fire, abandon ship, and man overboard. One can never be too cautious. The Gulf of Maine. Photo courtesy of NOAA. 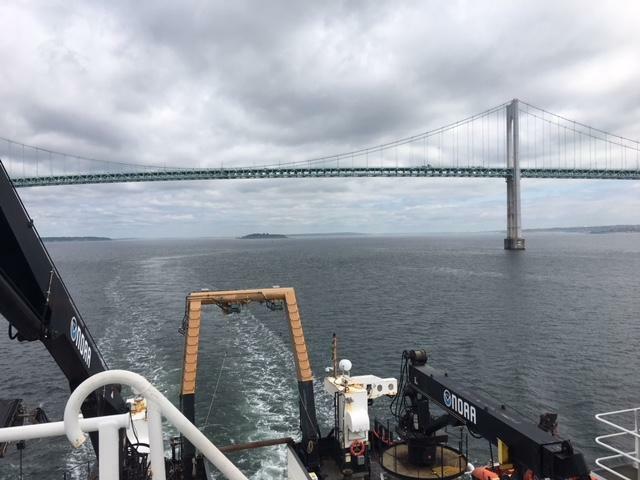 The second leg of the 2017 Spring EcoMon Survey consists of research at oceanography stations in the Georges Bank and the Gulf of Maine. 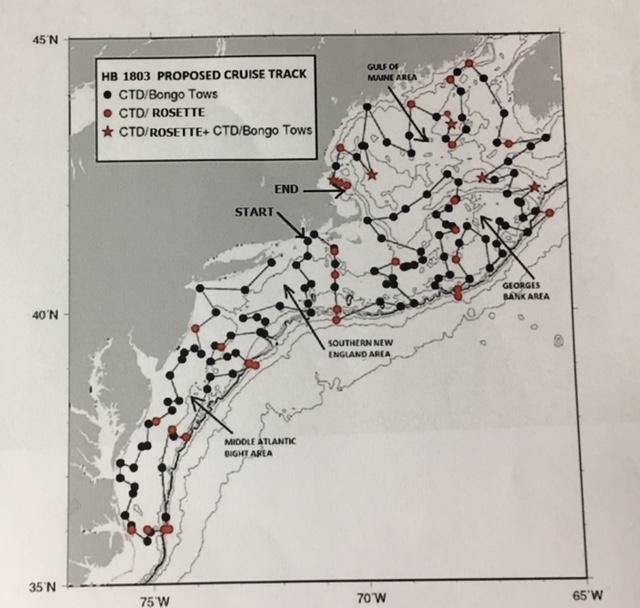 These stations are randomly distributed and progress of the survey will depend on transit time, sea state, and water depth of the stations. Our research will calculate the spatial distribution of the following factors: water currents, water properties, phytoplankton, microzooplankton, mesozooplankton, sea turtles, and marine mammals. At 2:07 p.m. (our scheduled departure time), Gordon Gunter cast off from Coddington Cove at the Naval Station Newport. As we approached the Newport Bridge I took photos of the NAVY War College, Herring gulls nesting on a small island, passing ski boats, and the ocean view cottages. On the flying bridge an expert in magnetic compasses calibrated the ship’s mechanism and cleared the compass of excess debris. During a personnel transfer using the Fast Rescue Boat (FRB), a mechanical issue was identified and the ship needed to head back to the pier. The Commanding Officer, Lieutenant Commander Lindsay Kurelja, informed us that we would begin our journey at 9:00 a.m. the next day, May 30. My head has been spinning with the different types of equipment and technology on board Gordon Gunter. I have a lot to learn! I would like to share a small bit of information about two important pieces of equipment that will be essential to our research in the coming days. 1.) Since the majority of plankton is too small to see with the naked eye, these organisms must be viewed through a microscope. To do this, plankton must be collected from the ocean. You might be thinking, “But how? They are too small to catch.” That’s why we use bongo nets! Bongo nets allow scientists to strain plankton from the water using the bongo’s mesh net. 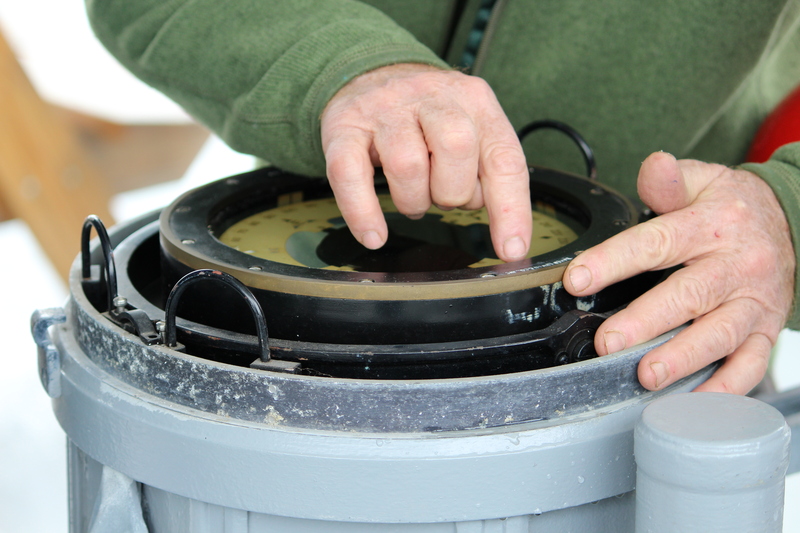 Plankton and other matter from the sea will be deposited into a bucket at the end of the net which is called a cod-end. 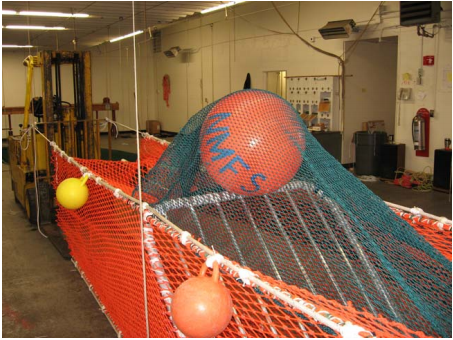 Different sized nets are used to capture different types of plankton. The bongo nets will be towed slowly through the water at each oceanography station we come to. 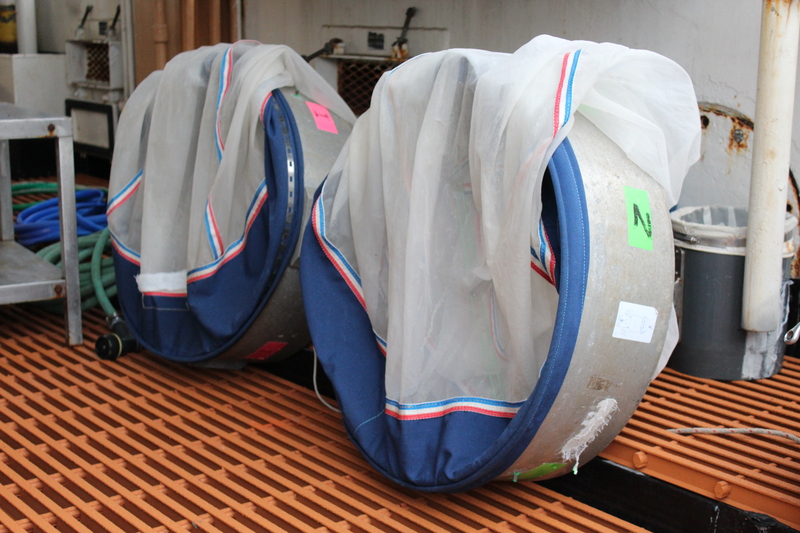 I am looking forward to using the ship’s bongo nets to investigate marine life in Georges Bank and the Gulf of Maine. 2.) 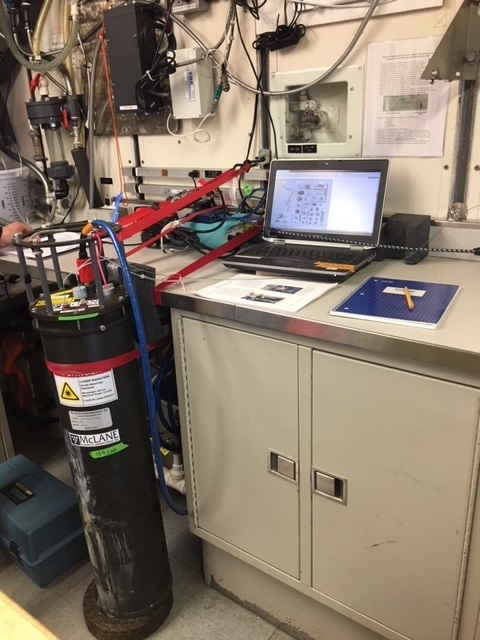 At each station of this leg of the EcoMon survey, we will use a CTD device to determine the Conductivity, Temperature, and Depth of the ocean. On Gordon Gunter, the CTD is incorporated into a rosette, or carousel. This allows us to collect water samples from various depths at the same location. 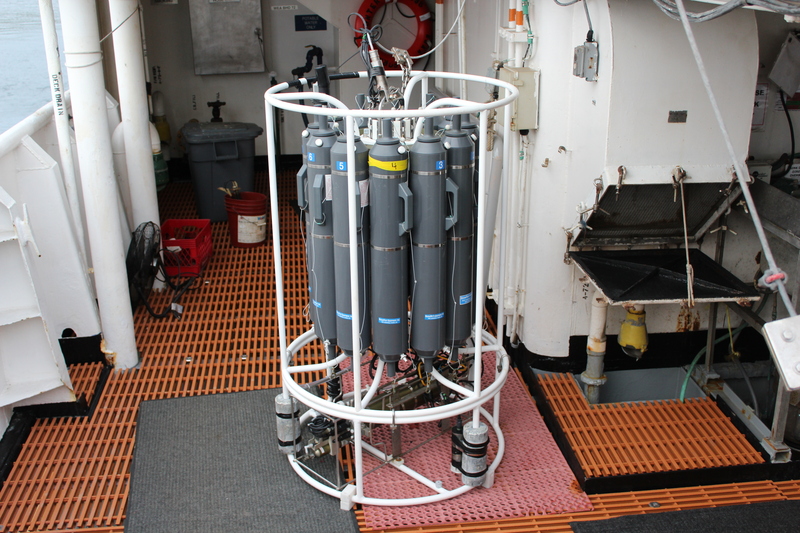 The CTD will give scientists a broad picture of the marine environment in the Northeast Atlantic. Aft Deck: the part of the deck towards the back of the ship. Deck: the outside top part of the ship that you can walk on. Forward Deck: the part of the deck towards the front of the ship. Port: the side of the ship that is on your left when you are looking forwards. Starboard: the side of the ship that is on your right when you are looking forwards. Stern: the back part of the ship. At Pier 2 at Naval Station Newport were gigantic buoys the Coast Guard had recently cleaned and re-painted. Do you know why some are green and some are red? The colors help aid the navigation of ships. 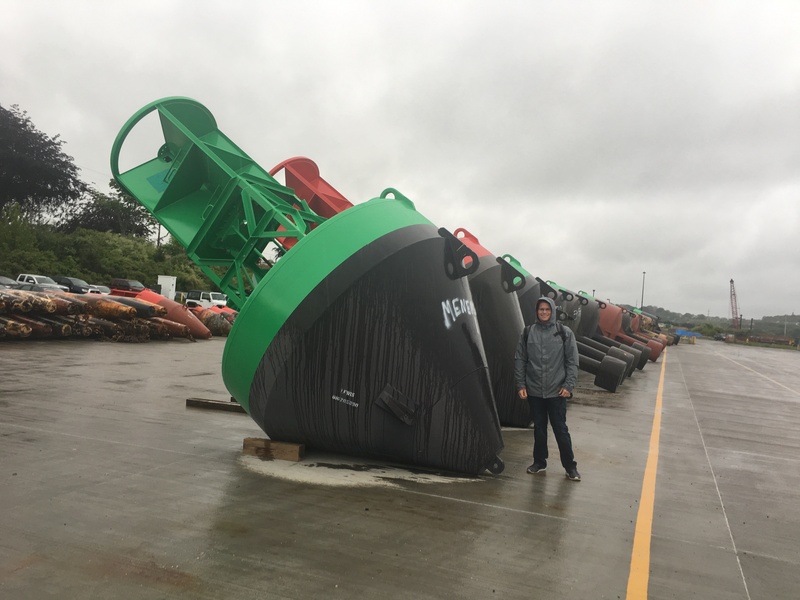 The red buoys are on the right/starboard side of the ship, and the green buoys should be on the left/port side of the vessel when heading upstream. I guess ships have their own rules of navigation just like vehicles on the road. I am honored to have been selected to take part in the Teacher at Sea Program. I’ll be driving down to Newport from southern New Hampshire in a few days to begin what should prove to be an amazing adventure working along with the fishery scientists and crew on the NOAA Ship Henry B. Bigelow (FSV 225). 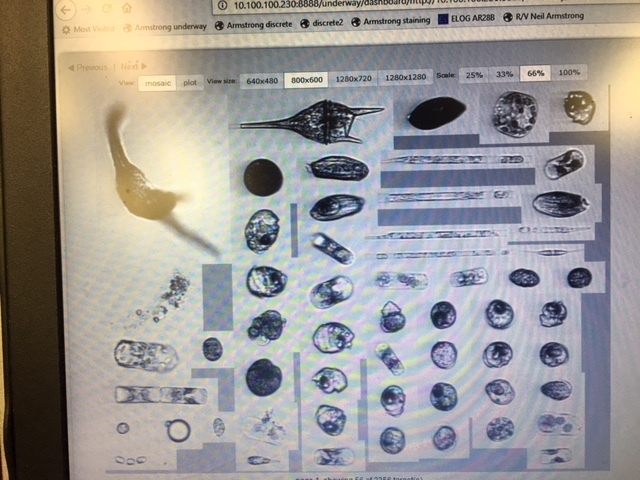 The purpose of the Spring Bottom Trawl Survey is to monitor the fish stocks and invertebrate found on the continental shelf. The scientists will study any changes in ocean conditions and the sea life to make informed decisions for conserving and managing the fishery resources and their habitat. The Henry B. Bigelow was named in honor of the founding director of the Woods Hole Oceanographic Institution, the “Father of Modern Oceanography.” Henry Bryant Bigelow (1879-1967) was an expert on the Gulf of Maine and its sea life and a member of the Harvard faculty for 62 years. The ship is a state-of-the-art 208-foot research vessel commissioned in 2007. It boasts a “quiet hull” that allows the scientists to observe the sea life using sound waves with limited disturbance to their natural state. Fish that we expect to observe include: Monkfish, Herring, Skates, Dogfish, Atlantic Salmon, Hake, Cod, Haddock, Pollack, Flounder, Mackerel and more! I’m looking forward to viewing these specimens up close! I have been teaching middle school mathematics for 26 years at Hampstead Academy, in Hampstead, NH. How does a mathematics teacher find her way to intensifying her interest in the sea? In 2014 I was selected to attend a week at Space Camp in Huntsville, Alabama along with 200+ teachers from around the globe. While there I learned of the SeaPerch program. Soon after, I received a grant from the US Navy for several SeaPerch kits, journeyed down to Newport, RI Naval Base for a day of constructing the SeaPerch ROV, and then set up a SeaPerch program at Hampstead Academy along with a co-teacher and my husband. Cutting pipe, waterproofing the engines, soldering the microcontroller, and all the tasks to complete the build of the SeaPerches was such a proud achievement for the group! We are fortunate to be near enough to UNH in Dover, so with a group of my students, we toured the Jere E Chase Ocean Engineering Laboratory and tested our SeaPerch ROV’s in their wave and deep-water tanks. What a marvelous facility, welcoming student tours and hoping to spark an interest in the oceanography field. I hope to inspire my students to consider a career in STEM professions, to open their eyes to the possibilities in the field of marine sciences where the work they do can impact the present and future generation. Thanks you to the Hampstead Academy administration, fellow teachers that are taking over my classes for these two weeks, and for the support of the school community and my family and friends. Thank you to the dog sitter for Clover! Thank you to NOAA Teacher at Sea program for this enriching opportunity. The Henry B. Bigelow was the first NOAA ship to be named through a ship-naming contest by the winning team from Winnacunnet High School in Hampton, N.H.
Below is a picture of Clover at North Hampton Beach last week when we had some welcoming warm weather for a short spell. Some of the catch go through the grate (to the codend) while others escape the net through the hatch (shown by the orange buoy). Why is this important? For example, if all of one type of fish in a trawl escape through this MMED, we would be getting a different type of sample than we would if the equipment was off the nets. 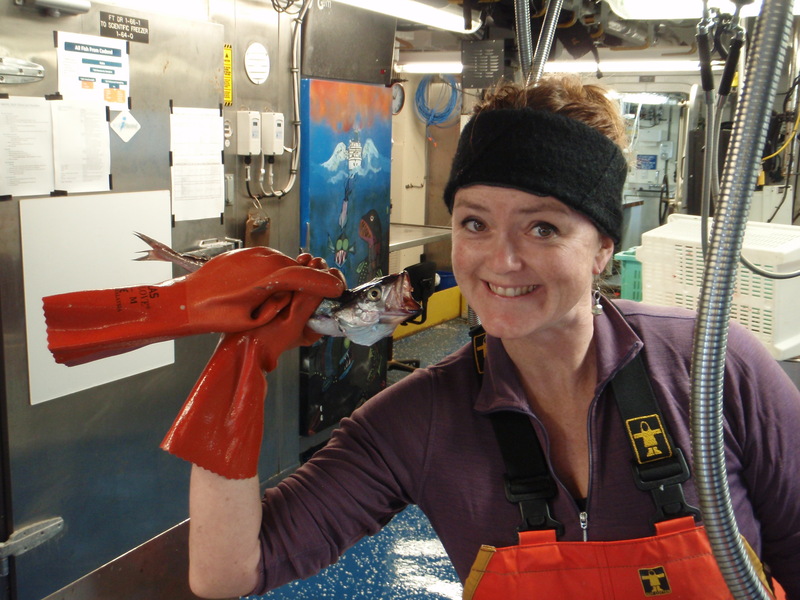 Our lead scientist, Dr. Sandy Parker-Stetter explained: “If all the rockfish go out the top escape panel, how will we know they were there?” To collect data on this, we will be doing a lot of trawls—or fishing, for those non-sea faring folk—some with the MMED and others without it. These will be small catches, we need about 300-400 fish, but enough to be able to make a determination if the equipment effect the data in any way. Wanted: must love fish. And science. All of this reminds me of why we are so concerned with accurately estimating the population of a little fish. 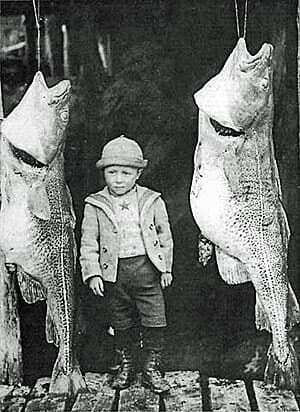 To illustrate, let me tell you a story—a story of a fishery thought too big to fail—the Great Banks Atlantic Cod fishery. 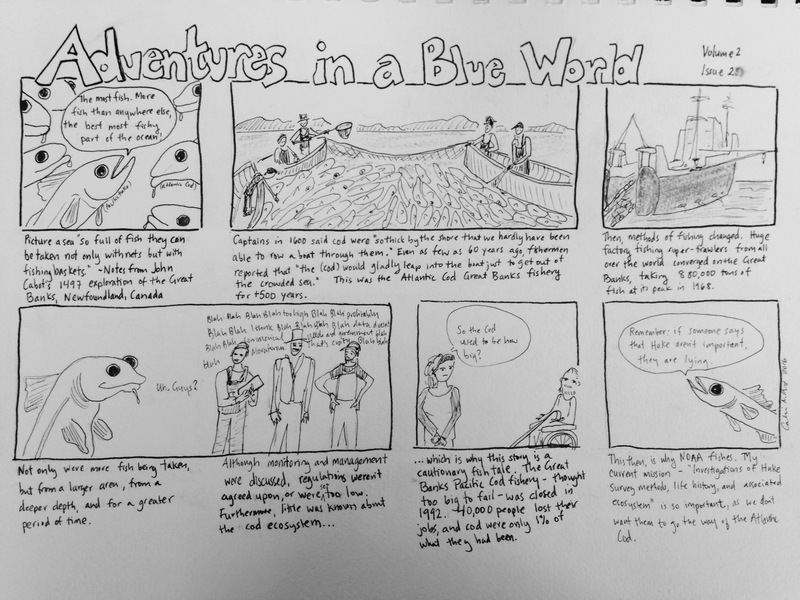 Why don’t you click on Issue 2 of Adventures in a Blue World: A Fish Tale, Too Big to Fail. Cod populations decreased to such a degree (1% of previous numbers), that the Canadian Government issued a moratorium on Cod fishing in 1992. Our mission—to investigate of hake survey methods, life history, and associated ecosystem—is designed to prevent such a devastating result. We don’t want Hake or other species to go the same route. We left the left the dock on Sunday at 1145, and made our way under the Newport Bridge and out to sea. It was really wonderful to watch the ship leave the harbor from way up on the Flying Bridge—the top-most deck of the ship. There are four tall chairs (bolted to the deck) at the forward end of the deck, an awning, and someone even rigged a hammock between two iron poles. It is rather festive, although again, there were no drinks with umbrellas being brought to us. The end of the fishing net is called the codend. Who knew? This and many more things can be learned about fishing from reading this handy reference guide.